Publications, manuscript and electronic books are the life blood of the CoED Foundation. Most publications have either been written, co-written or edited by the CEO, Maurice Irfan Coles. Some of these are very current; others are slightly older, but all have a bearing on 'Compassion in Education'. We thought it would be helpful to provide other publications that are relevant to 'Compassion in Education', including those we have had some or no part in. Those posted are available free to download under creative commons license. All contribute to the Foundation's core purpose. If you would like to support us please make a donation or get involved. Find out more about how we can work together. 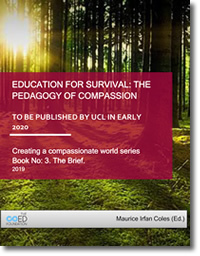 University College London (UCL) have agreed to publish this, the Foundation's third book in the series creating a Compassionate World, in early 2020; perhaps an apt date as it aims to offer a clear and achievable vision of what education could and should look like in the next decade and beyond. As it stands there are over twenty authors involved in putting what is really a complex tapestry together. The main writing team and I have discussed the book's contents thoroughly over the last few months and I have been active in recruiting an amazing array of authors. So can I please thank you all for 'volunteering' to contribute. The book has gone through a number of titles but we have now resolved to call it "The Pedagogy of Compassion: A Blueprint for Schools and Colleges". We have added colleges because there are so many similarities with the school and college sectors and because there are several other books that focus on higher education, one of which I am to contribute to. 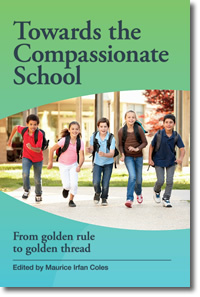 Our book is very comprehensive and we are covering a lot of ground but our overall aim is to offer a detailed blueprint for building a compassionate school, and in the longer term a more compassionate world. Since the birth of this millennium the concept of compassion has gone viral. There is an increasing interest world-wide in the place of compassion within individuals' lives, within society, and within education. The founding of an increasing number of local and global organisations and charities—including the CoED Foundation which is dedicated to bringing compassion into education and learning and which has a growing reputation in this field—are both a symptom of this increasing interest and the associated need to provide related material and activities. 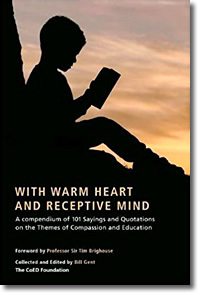 In part inspired by advances in neuroscience and the science of compassion, more and more books have been published on compassion in a variety of fields. There is however sadly little work on compassion and education. This book will help meet that need. There is a growing international movement which aims to restore compassion to the world's epicentre. In part inspired by the Charter for Compassion, it argues that the Golden Rule, 'Treat others as you would wish to be treated,' lies at the heart of all religious, ethical and spiritual traditions. An increasing number of cities and schools, and one country have signed the charter, declaring their intention to become 'compassionate.' To date, however, little has been written which provides a conceptual, theoretical and practical overview of the education system through the prism of compassion. This innovative and radical book addresses that gap arguing that, unless we can alter the prevailing educational paradigm so that all young people are actively taught collaboration and the value of service, as an antidote to the present dominant acquisitive individualistic norms, then the future looks very bleak. Although each chapter has been written as a stand-alone, they are interwoven and consistent in their compassionate message. Dr. Keith McGee from Boston University and Baroness Estelle Morris from the UK Parliament provide the fore and afterwords.